Ben Wilson wants to improve on his best result of the British Supersport championship season this weekend. He will return to Cheshire’s Outlton Park this Friday, Saturday and Sunday, eager for a successful round. 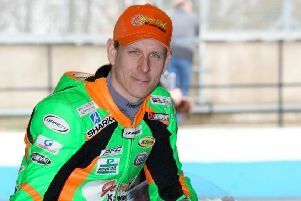 Wilson scored his best result of the current campaign at Cadwell Park last time out and will be seeking a similar or better result at Oulton on his second visit of the season. The Cheshire circuit is one of Wilson’s favourite venues and he usually scores well there, recording many race wins over the years. He is optimistic that he can edge nearer to a podium finish in the two races which will boost his points tally and help him remain within the top 10 in the rider standings. There are two free practice sessions on Friday at 9.35am and 1.55pm followed by qualifying on Saturday at 11.45am, positions in this will set the starting grid for the 12-lap sprint race at 3.45pm that afternoon. The feature race that will run over 15 laps of the Cheshire circuit will take place on Sunday at 3.45pm, with the grid positions being set by the fastest lap in the sprint race. As usual both races will be televised live on Eurosport 2 on Saturday and Sunday.